RESTON, Va. – Researchers have developed a new imaging agent that could help guide and assess treatments for people with various neurological diseases, including Alzheimer’s, Parkinson’s, and multiple sclerosis. The agent, which is used in positron emission tomography (PET) scans, targets receptors in nerve cells in the brain that are involved in learning and memory. The study is featured in the April issue of The Journal of Nuclear Medicine. Swiss and German scientists developed the new PET radioligand, 11C‐Me‐NB1, for imaging GluN1/GluN2B-containing N-methyl-D-aspartate (NMDA) receptors (a class of glutamate receptor) in nerve cells. When NMDA receptors are activated, there is an increase of calcium (Ca2+) in the cells, but Ca2+ levels that are too high can cause cell death. Medications that block NMDA receptors are therefore used for the treatment of a wide range of neurological conditions from depression, neuropathic pain and schizophrenia to ischemic stroke and diseases causing dementia. For the study, 11C-Me-NB1 was used in live rats to investigate the dose and effectiveness of eliprodil, a drug that blocks the NMDA GluN2B receptor. 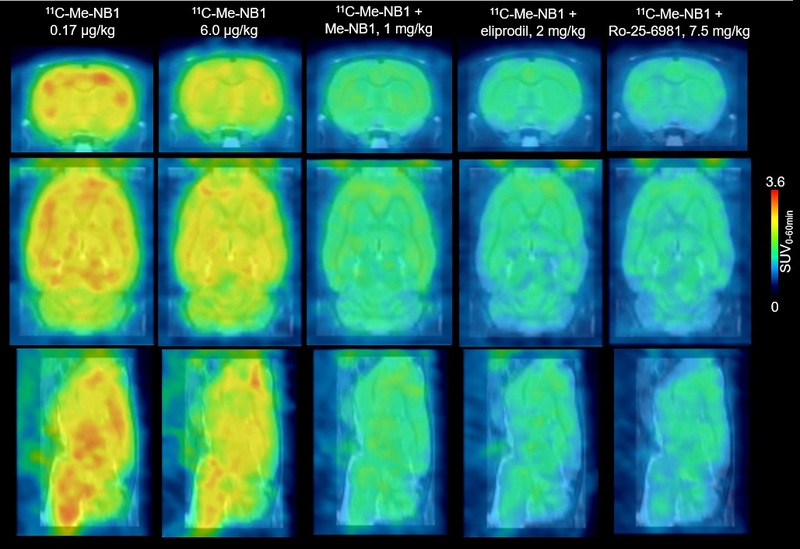 PET scans with the new radioligand successfully showed that the receptors are fully occupied at neuroprotective doses of eliprodil. The new radioligand also provided imaging of receptor crosstalk between Sigma-1 receptors, which modulate calcium signaling, and GluN2B-containing NMDA receptors. Authors of “Evaluation of 11C‐Me‐NB1 as a potential PET radioligand for measuring GluN2B‐containing NMDA receptors, drug occupancy and receptor crosstalk” include Stefanie D. Krämer, Thomas Betzel, Ahmed Haider, Adrienne Herde Müller, Anna K. Boninsegni, Claudia Keller, Roger Schibli and Simon M. Ametamey, Institute of Pharmaceutical Sciences, ETH Zurich, Zurich, Switzerland; Linjing Mu, University Hospital Zurich, Zurich, Switzerland; and Marina Szermerski and Bernhard Wünsch, University of Munster, Munster, Germany. This study was financially supported by the Swiss National Science Foundation (Grant Number 160403).